"Each of us carries the responsibility of upholding the principles of justice and common decency - it falls on ... ordinary people ... It is the cumulative effect of their sustained effort and steady endurance which will change a nation where reason and conscience are warped by fear into one where legal rules exist to promote our desire for harmony and justice". This page presents the text of the Jesuit 2004 Lenten Lecture, To Build Peace and Bring Hope, delivered by Mark Raper SJ. 8 July 2004: Between Anguish and Hope: A World of Refugees - Mark Raper SJ delivers the 2003 Rerum Novarum Lecture. "...our country has dramatically changed its core foreign policy directions. Australia has recently intervened military in other sovereign states. Australia has broken with time honoured international conventions for the protection of refugees and the preservation of human rights." May I acknowledge with you the traditional owners of this place. Theirs is the oldest living human culture, deserving our deepest respect. May I also acknowledge you who are members of Australian Catholic University (ACU), students, teachers and administrative staff. In Ex Corde Ecclesia, the Holy Father asks, "What is a Catholic University?" First and foremost, he says, it must be a good university. A Catholic university is mandated to offer, through its leadership, curriculum, teaching and student bodies, and through its cooperative undertakings, effective avenues for addressing the needs and desires of many people and of society. A Catholic university, based as it is on gospel values, and committed both to the pursuit of academic excellence and service to the wider community, has both the freedom and the obligation to work for justice and thus to serve our desires for peace. While I have this opportunity, may I congratulate ACU and through you, Vice Chancellor, thank the University for its creative initiative in enrolling 24 Burmese refugees currently living in jungle conditions at the Thai Burma border in a joint project with the Jesuit Refugee Service (JRS). In this way these young refugees, though still in camps, and though their people are not yet at peace (indeed theirs is one of the world's longest running conflicts), do not lose their time of waiting. Refugees are not new. Even the story of Adam and Eve speaks of their exile. For as long as intolerance and oppression have been part of human history, there have been refugees. The numbers of people uprooted today, and the extent of human suffering may not be proportionately greater than at other times in history. The numbers displaced by the Second World War, for example, were in the tens of millions. But with the spread of modernity and its means of communication to every corner of the globe, not only have the total numbers risen, but we are also more aware of them. Contemporary media makes their plight, the size, frequency, speed and complexity of the refugee crises, immediate to us all. The arrival of a small number on our shores, not in itself a new phenomenon, is now a matter of hyperbolic rhetoric in Australia and in most Western societies. Refugees are everywhere, and so are stories about them. Refugees today move in new directions, and can arrive anywhere, although it is often overlooked that 90% of them remain in the poorest countries. Rather than searching for ways to protect the rights of asylum seekers, states present themselves as overwhelmed by a crisis. But instead of seeking solutions, they try by all means either to ignore the problem or to block the movements. Yet harsh legislation, ostensibly designed to protect states against refugees and migrants, only serves to strengthen illegal operations that bring desperate people across borders. The real refugee crisis is that the root causes are again overlooked, and that the international set of agreements designed to offer protection to refugees is now being dismantled, piece by piece, by the states that signed them into force. My lecture tonight is entitled, "To build peace and to bring hope". It is a Lenten lecture. "During Lent, we prepare to relive the Paschal Mystery, which sheds the light of hope upon the whole of our existence, even its most complex and painful aspects", wrote the Pope in his message for Lent 2004. And in his Peace Message last January 1st, he spoke of love "... the deepest hope of every human heart" as the foundation of authentic and lasting peace. To be a refugee is a complex and painful human experience. If we will hear them, the refugees will teach us what it is to bring hope, and what are the ways to build peace. I have chosen to speak about the worldwide movement of refugees today, about what I believe are the causes of this phenomenon, how it impacts on our society, and what we can do in response. With your permission, I do not pretend to give an academic lecture. Rather I will seek to reflect on my experiences of living and working with refugees for over 20 years. "Building Peace, Bringing Hope" is also the theme for Caritas Australia's Project Compassion appeal, which begins today and runs throughout Lent. Caritas Australia is the finest and most effective non-government organisation (NGO) of its kind in Australia. It deserves and needs your support. Caritas is grass roots, it goes to the root causes of poverty, disadvantage and conflict and it is inspired by compassion. The Caritas international federation comprises 154 national relief, development and social work agencies present in 198 countries and territories throughout the world. This federation commands more personnel, a greater budget, and a broader public involvement than any agency of the United Nations (UN), indeed of several UN agencies together. Because of its network of local partners, Caritas is close to people in need, it responds quickly to changing conditions and it stays when other agencies leave. For example, Caritas Iraq, supported by Caritas Australia, continues to work with the Iraqi people despite the exodus of other NGOs and UN bodies. How is it that so much resources and energy are spent, by individuals and governments, in order to avoid what we fear, yet so little is spent on pursuing what we love, respect or long for? In order to build peace and to bring hope, we are invited to follow our hearts rather than to surrender to our fears. "If you want peace, work for justice", said Pope Paul VI. But his advice is contrary to the logic of some other world leaders. In response to threat facing his country, the President of the world's most powerful state could only promise to lead the world into a war that will not end, against an enemy that is not clear. The Iraq war revealed the tragic failure of international diplomacy. It showed that a nation may be powerful to destroy, but it takes a totally different type of power to build. Project Compassion's theme, "Building Peace, Bringing Hope", takes up the gospel call, 'Do not be afraid' in a world increasingly dominated by fear and insecurity. Fear is dominant in the formulation of both international and domestic policies today. The logic of fear leads to anxiety, isolation, suspicion, inaction, violence. By contrast the way of the gospel speaks to our desires. 'Do not be afraid' is a way of releasing dreams and desires of peace and hope. The logic of desires leads to confidence, trust, reconciliation. Hope is different from optimism. Hope arises from lived experiences of suffering. 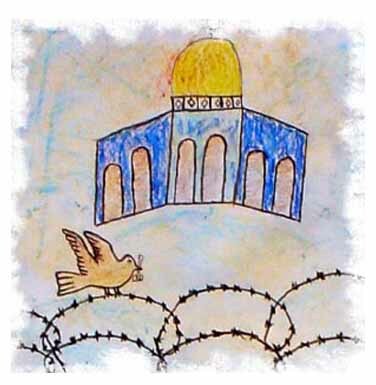 Imagine the will, the sustained desire, the strength of character, needed to keep a refugee's hope alive, not only in escaping persecution, but in surviving ongoing detention, isolation and vilification. Through some stories and some pictures, I invite you into the refugee experience, and through that experience to another way of viewing our world. Not all refugee stories have happy outcomes, in fact far from it. Sometimes we experience only our powerlessness. Yet we can learn from all of the stories. Gabriel, a six-foot-six Dinka, had arrived in Thailand after a journey that, for his people, rivalled Marco Polo's. Travelling by foot to escape the fighting which had begun in 1983 in his home in Southern Sudan, he had crossed into Egypt and on to Iran to study, but instead was drafted to be a porter in the Iran-Iraq war. Escaping, he failed to get passage westwards to Europe and so, heading east towards Australia, was stopped in Singapore and diverted to Thailand. There I found him, culturally disoriented, alone and desperate. He visited frequently, and with an officer from the United Nations High Commissioner for Refugees (UNHCR), we searched everywhere for a country to take him. Australia, New Zealand, USA, Canada, Sweden, none would even interview him. Finally he was offered three choices, a trip home to the Sudan, or Kenya, or Liberia. In desperation he accepted Liberia and departed in 1987. The women in our office gave him the biggest shirt they could find in the shops. Several times he wrote to me, his words dictated to a Scottish Salesian priest. A few years later I was in my new position in Rome. Deeply moved by the suffering of the Liberian people, I went in 1992 to war-ravaged Monrovia to see what could be done. While there I hunted for Gabriel. Visiting the Salesians, I asked if they had known him. Sure enough, they pointed me to a Scot, the one who had written Gabriel's letters. He told me how Gabriel had died, mistaken for a Mandingo, waving his long arms and showing his refugee card, trying to explain to a drugged, over-armed Krahn follower of Charles Taylor, that he was 'under the protection' of the United Nations. I wept for Gabriel and the many victims of that senseless never ending war. Perhaps there is no moral to draw from the story of Gabriel who had traversed, mostly on foot, the geography of our world of conflict and refugees: escaping the Sudan war he was caught in a middle Eastern one, blocked when trying asylum routes west, east, south and north, caught in the eddy of the Indochinese refugee tide, finally a target in someone else's war. Every continent and every region of the world is affected by forced displacement of people. Over the past 25 years almost every country in Africa, for example, has either produced or received refugees. Generations of people in Africa, the Middle East and Asia have known no other life than a refugee camp. Denied education, children lose their hope in the future. Adults lose their roles, their skills and their dignity. Communities become dependent and cultures are atrophied. Lost generations linger in legal, social and political limbo, often ignored by the international community. When not ignored, the lives of refugees risk distortion in the media. The history of refugees over these past 25 years is marked at mid-point by the decisive events of 1989, the collapse of the Berlin Wall and the end of the Cold War. In the 80s and before, those who fled communist regimes received most attention. Almost two million Indochinese, for example, were resettled in over 30 countries, among them many came to Australia. In 1990, a moment in time when contemporary world history changed dramatically, I was moved to Rome. During the 1990s the agency that I was directing was engaged deeply with an immense range of peoples in crisis. Of course we continued our work with the Cambodians, Burmese, Tamils from Sri Lanka, Afghans and the Bhutanese in Nepal. But a lot of my time was spent in Africa. In the Horn of Africa, I worked with the Eritreans and Tigrayans, and when the fortunes of war changed, with the Amharic speaking Ethiopians; also with Somalis and with the Sudanese who are displaced into Chad, Congo, Uganda, Kenya, Egypt and Ethiopia because of a conflict over pasture land, the waters of the Nile, oil and Shariah law. We worked with the Mozambicans who were in Malawi, Tanzania, Zimbabwe and South Africa, and with Angolans, with Liberians, with Congolese, Rwandans and Burundis. In Latin America our engagements were with El Salvador, but after the peace agreement and their return home, we turned our efforts to the Guatemalans in Mexico, then to the Colombians, and the Haitians in the Dominican Republic. Of course the Balkans and the terrible conflict in Bosnia claimed our attention. Our team was in Sarajevo throughout the conflict of the 90s, but also in Serbia, Montenegro, Macedonia, Albania, Kosovo and Croatia. Through all this time in the United States and in Europe, as here in Australia, the latest conflicts were reflected in the faces and identities of the latest arrivals. The universal geography of displacement finds its mirror in the immigration and detention centres of every city in the world that has an international airport. Why do refugees leave home? In classic migration theory, three sets of factors influence human movement: Push, Pull and Networks. Multiple factors are at play when a person chooses to leave home. Studies have revealed that the top ten reasons for asylum seekers coming to Australia are 'push' factors. That is, they were forced to leave. But before examining or seeking global explanations, let me try to paint the scenario of one conflict that created mass displacement of people. In a few weeks, in Holy Week to be precise, we will commemorate 10 years since the Rwandan genocide began. It began in early April with the killing of President Habiyarimana, and then with the assassination of a group of people at Centre Christus, the Jesuit retreat centre in Kigali, on 6th April 1994, among them three Jesuits, one of them the director of the local JRS program. The world was shocked by the genocide that raged, taking over 800,000 lives in a few months, but it was also paralysed. It was portrayed as ethnic conflict, as if that truth was also an answer or an explanation. Prising open the layers of Rwandan society, one can find some factors that help us, if not to accept, at least to begin to understand. Rwanda's population, 3 million in the 60s, had risen to almost 8 million in 1994 and its density was among the highest in Sub-Saharan Africa. The new experience of nationalism in Africa rigidified the national borders and made the natural nomadism of previous centuries impossible. By the mid eighties the family farming plots had been divided up as much as seemed possible, leaving second, third and fourth sons without an income and without a future. At about this point in time the international market for Rwanda's principle commodity, coffee, collapsed to a half of its former value. Another factor was the growing scourge of HIV/AIDS which left many young people without fathers and the direction of their parents. Since independence in the sixties, the Belgians had intensified their input into education for the Hutu population, therefore many boys and, for Africa, a high proportion of girls, had the opportunity for secondary school education. So there was a significant population of young people whose hopes and expectations had been raised by their schooling, but who were now uprooted, instead they were left landless, jobless and futureless. At that time the President of the country was a Hutu, but under intense international pressure, he was about to sign into law the Arusha Agreement to allow a more democratic process in the country, with the consequent risk that he would lose power. In the attacks of April 1994 that precipitated the genocide, extremist Hutus first targeted moderate Hutus and any other moderate figure, whatever their ethnicity. Then, seeking by all means to retain power, they exploited this discontented mass of young people, using radio stations to send them to the hills with a poisoned message of ethnic hatred. Ethnicity and discontent, bred from poverty, were exploited by individuals for corrupt reasons. "It is not power that corrupts, but fear", Aung San Suu Kyi  tells us in a comment learned from her own experience. "Fear of losing power corrupts those who wield it and fear of the scourge of power corrupts those who are subject to it." Could the international community have done something to stop the Rwanda genocide? It takes an agency like Caritas, which is on the ground in all these places to alert us to such situations. Or it takes a university, which specialises in studying society and human problems. But could powerful nations have done something? 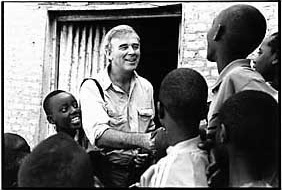 General Dellaire, the Canadian who commanded the tiny UN peace keeping force on the ground in Kigali at that time, believes if his mandate was changed, he could have intervened early. But remember, April 1994 was but a few months after the Black Hawk Down incident, when 15 US servicemen had been dragged through the streets of Mogadishu, Somalia in humiliating view of the CNN cameras. Immediately the US began to withdraw. Their withdrawal, completed in March 1994, days before the Rwandan genocide began, was accompanied by US horror at humanitarian intervention and Presidential commitments not to send US troops abroad again in an international force unless they were under direct US command. This Rwandan vignette shows the complexity of one situation, where there has been remarkable recovery and healing. Yet, without wishing to depress you, it is important to indicate that the countries around Rwanda remain in crisis: Uganda to the north, where about 1 million people are internally displaced; Congo to the west where, according to a longitudinal study over the past 4 years by International Rescue Committee, some three million people have died over the past ten years because of conflict or conflict induced disease and starvation. In Burundi to the south, hundreds of thousands remain internally displaced, and similar numbers are refugees in Tanzania. Three hundred thousand people of Burundi have died in conflict since 1993, including a few weeks ago, the Apostolic Nuncio, the Pope's ambassador in Burundi. James Wolfensohn, who heads the World Bank, was interviewed recently in preparation for a visit to Australia. If a Martian were to land here, he was quoted as saying, it would report home that this planet is crazy. A minority on the planet live for today and do not see the majority of poor. The developed countries of the world spend immense amounts on arms but only a fraction on aid. The poverty and despair of many of the 5 billion people in the developing world only help fuel terrorism and extremism. "I personally feel the world is out of balance," he is quoted as saying. "The way the world is dealing with problems of poverty and peace seem to be disconnected." Military spending worldwide is now probably $US1000 billion ($1315 billion), and spending on subsidies or tariffs to protect farmers in the developed world is about $US300 billion. In comparison, wealthy countries offer no more than $US50-$US60 billion in aid to developing countries while blocking most of their agricultural exports - one of the few opportunities these countries have to haul themselves out of poverty. "There will be no scope for a Pacific Solution II and no adequate resources for the infamous use of naval force in Operation Relex. The seeking of refuge will not only be a basic matter of international peace and security, it will also be a massive challenge and call for leadership at all levels of society." "Our greatest challenge at the beginning of the 21st century is poverty. Our greatest debt is the debt to our brothers and sisters in the poorest parts of the world. Our greatest hope is our common humanity and solidarity. And our greatest strength is our commitment to work together. I would like to think we can all take that message back to our communities, our institutions and our Governments..."
If, as Cardinal Murphy O'Connor claims, the greatest threat to world today is poverty not terrorism, why do we not have a war on poverty rather than war on terror? The Polish sociologist, Zygmunt Bauman has written yet another stimulating book reflecting on modern society. He goes further in his analysis than simply naming poverty as a cause, he examines the inequity that modernity requires. His book is called 'Wasted Lives, Modernity and its Outcasts',  in which he examines the production of 'superfluous' populations of migrants, refugees and other outcasts, the inevitable outcome of modernisation. Formerly, he claims, the large parts of the world that were wholly or partly unaffected by modernisation were able to absorb the excess of population of developed countries. Global solutions were sought, and temporarily found, to local problems. Convicts and unemployed were sent to Australia, and the Americas, for example, with disastrous consequences for the indigenous societies. Now, as modernisation reaches every corner of the globe, this 'redundant population' is produced everywhere, and all locations have to bear the consequences of the triumph of modernity. Now we have to seek local solutions to globally produced problems. As a result of the spread of modernity, growing numbers of human beings are deprived of adequate means of survival and the planet appears to be running out of places to put them. Hence the new anxieties about immigrants and the growing role of diffuse security fears in the political agenda. Bauman also comments on how the forces of globalisation strip governments of their sovereign prerogatives. People see the local store, the local bank and post office disappear from their neighbourhood, even from the control of the national economy. When the real culprit may be the micro chip, governments can attempt to demonstrate that they are asserting their sovereignty by flexing their muscles and firing salvos at selected targets, such as petty crime and asylum seekers. Why does our government keep children locked away in detention centres and on remote Pacific islands? It now claims that this punishment of a few will save others that it will deter them from seeking to come to this country. It may. It may work for a few more months. But in no way does this approach address the fundamental problems that confront our world. It is an egregious distraction from the real problems and it is a miserable exploitation of people as means to an end. At Christmas I was startled to receive a letter from Senator Amanda Vanstone since an organisation, A Just Australia, of which I am one of many patrons, sought to find a resolution to the hunger strike of the people on Nauru. She wrote to me: "I ask you to imagine how you would feel if one of the strikers was a loved one of yours. Persuading them to end their dangerous course of action would have to be the first priority." I replied to her: "I am heartened that you would ask me to imagine how I might feel if one of the strikers were a loved one of mine. Could I urge upon you the same test as you now take up this demanding portfolio of immigration. Given that the majority of boatpeople who have arrived in Australian waters in recent years have been proved to be refugees, should we not design policies which take as their starting point your imagination test?" Shall we really spend our whole time on discussing internal problems of the Church while two thirds of the world population are starving to death? What is our message in view of the question of underdevelopment? Will the Council express its concern for the great problems of mankind? Is the shortage of priests Latin America's biggest problem? No! The biggest problem is underdevelopment. Out of that impulse many organisations were begun, among them our own Australian Caritas which is indeed now 40 years old. That Council was not a dress rehearsal. Life is not a dress rehearsal. But Lent gives us time to reflect. And you students at university have the opportunity to test values, to enquire into what is right, to acquire discipline in your thinking, and to learn how to build peace and to bring hope. Kerry Murphy, "Refugees in Australia: Unwanted Strangers?" in Jesuit Refugee Service Australia, Occasional Paper No 3, September 2002.